Synopsis: This book sets out to change the ‘firing’ experience into being easy, straightforward, positive and generous to complete. Firing staff is a necessary and essential part of a manager’s role. Traditionally such meetings are known as ‘Difficult Conversations’ which leads the manager to expect and prepare for difficulties. This book sets out to change that expectation to these meetings being easy, straightforward, positive and generous to complete. Even when it comes to providing feedback about attitude. The book identifies all the actions a manager needs to take to build great relationships with their staff; what to say in the feedback statement; and what to include in the conversation to ensure that improvements are made or the individual leaves the organisation. And if it comes to the individual being fired then doing it in such a way that they say ‘thank you’. 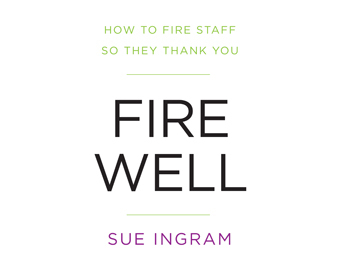 Easy to read, pragmatic and based on Sue’s many years of conducting feedback conversations as well as firing people who then said thank you, this book is required reading for all managers at all levels in the organisation. Backed up by online worksheets and videos which prepare and equip today’s managers to conduct positive, generous and necessary feedback conversations.